My children‘s diets are very important to me. I make sure they eat healthy nutritious foods including fruits and vegetables. Sweet sugary snacks are reserved for special occasions only. Sometimes it is a challenge to get my picky eaters to eat their fruit and veggies. Peter Rabbit Organics, a small, privately owned company based in London, makes it convenient for parents to feed their young children fresh organic fruits and veggies with their all natural veggie and fruit purees. The fruit pouches are 4oz and the fruit and veggie pouches are 4.4oz. All of the Peter Rabbit Organics snack pouches are US certified organic. They are sugar-free and contain no artificial ingredients so I know my kids are getting a healthy snack. The mess-free pouches make it easy for me to feed my children a snack while on the go or even at home when I don’t want to dirty another dish. I can just twist off the top and they can feed themselves directly out of the pouch. Peter Rabbit Organics BPA-free fruit pouches come in four delicious flavors: Apple and Grape, Peach and Apple, Strawberry and Banana, and Mango, Banana and Orange, the veg and fruit pouches; also BPA-free, come in three delicious blends: Sweet Potato, Corn and Apple, Pea, Spinach and Apple, Carrot, Squash and Apple. My children were especially fond of the Pea, Spinach and Apple. 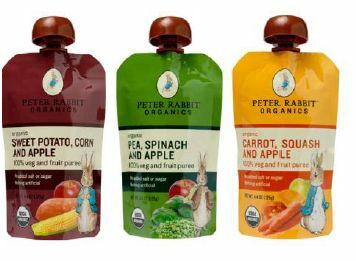 Peter Rabbit Organics veg and fruit purees are available at Amazon.com, Babies R Us, Diapers.com, Albertson’s, select Starbucks stores, Whole Foods Markets, Buy Buy Baby stores, and natural food sellers across the country for an SRP of $1.79 each. Related Raspberry Ketones: A Miracle Fat Burner? For more information please visit: peterrabbitorganics.com. Peter Rabbit Organics can also be found on Twitter and Facebook. Healthy Moms Magazine Readers can enter to win 12 assorted pouches of Peter Rabbit Organics fruit snacks and fruit and veggie pouches. All you need to do in order to enter is follow Peter Rabbit Organics on Twitter and like Peter Rabbit Organics on Facebook then leave us a comment along with your e mail address. This contest ends on Thursday February 16, 2012 at 8 am PST and is open to US residents only. For every entry including extra entries please leave a separate comment. Winners will be chosen randomly from the comments and e mails that I receive. The contest ends on February 16, 2012 at 8am PST and is open to anyone in the US. Please leave your e mail address in your comments. All comments without e mail addresses will be disqualified. *Disclosure: I received a sample of Organic Sweet Potato, Corn and Apple 100% veg and fruit puree, Organic Mango, Banana and Orange 100% pure fruit snack, Organic Strawberry and Banana 100% pure fruit snack and Organic Pea, Spinach and Apple 100% veg and fruit puree in exchange for this review. All opinions are accurate and 100% mine. My nephew eats a lot of organic baby food. It amazes me how many different options there are compared to what there used to be when my kids were young. I've seen these in our local store and am interested in trying them with my son, who's just started eating solids. Liked Peter Rabbit Organics on Facebook, but I do not have a twitter account. Is this good enough to enter me into the contest? following PR Organics on twitter and FB! I'm following Peter Rabbit on Twitter @octoberthings and like them on FB! I follow Peter Rabbit Organics on Facebook and Twitter! I'm following on Google Friend Connect as Danielle/See Shop Love! Following on both sites! I love organic pouches like this but haven't yet tried this brand!! My son loves these! Big Fan of Peter Rabbit Organics! i liked and follow the sponsor! I follow Peter Rabbit Organics on Twitter and like Peter Rabbit Organics on Facebook! Thank you for the giveaway! I subscribe to the Healthy Living newsletter! I stumbled the post! I am rkosully on StumbleUpon. Thanks! I liked PRO on Facebook and follow them on Twitter as ilovemygooby. ilovemygooby@yahoo.com. i follow you on Twitter as ilovemygooby. ilovemygooby@yahoo.com. I follow Peter Rabbit Organics on Twitter and like Peter Rabbit Organics on Facebook. Like & Follow Peter Rabbit Organics on FB & Twitter! I like them on fb and follow them on twitter. I liked them on FB and Twitter as Raquel Beaty and RaquelBeaty! I follow Peter Rabbit on Twitter @kidsanddeals and facebook. -I like Peter Rabbit on Facebook: Francine E.